Some of the most delightful things come when we stop struggling to do things the way they've always been done and we open ourselves up to the unconventional. When I turned 30, I set a lot of big-picture goals for myself, vowing to stay open minded and positive no matter the outcome. It was terrifying to embrace that sort of vulnerability--the kind that asks you to sprint towards doubt with eyes squeezed shut and hope for the best. The last few years I've embraced change and taking risks. I know that the most liberating feelings happen once I leap outside my comfort zone and decide to just do it already. Keeping this all in mind, I faced this year with relentless optimism. I dreamed big. I prioritized my own happiness. I mustered up the courage to apply to my dream job [and was lucky enough to get it]. I let love in. I learned when to walk away. I embraced my flaws. I found an apartment with amazing light and a farmhouse sink. I learned to say no. I rediscovered what it meant to be part of a community. I let myself mourn. I embraced my affectionate side. I traveled to Hawaii with some amazing human beings. I jumped out of an airplane. I failed a bunch. Normally after such huge emotional endeavors, I'd fill pages of my journal with reflections about the dreams I'm chasing, the doubts that seep through the cracks of my confidence, moments of overwhelming gratitude and questions I have in the midst of uncertainty. Despite all these epic achievements and important plot points, I realized that, unlike previous versions of my journaling-inclined self, I hadn't written much. Looking at this seemingly deserted blog (no pun intended), it's also a bit unusual to note that in the flurry of emotion, I didn't leave much space for writing here either. Normally, I'd worry that my feelings would evaporate into the ether if I didn't give them a permanent place in writing. I'd spend a few hours scraping the barrel of my memory to try to recall all of the tiny moments of awe and importance and frantically jot down what was left of them. I didn't make time record the joyful experiences while my cheeks were still curled up in a smile, or scribble down some of the doubts and anxieties I had while my heart was still racing. Looking back, I realize that's perfectly okay. In the midst of all these moments, I've spent a lot of time reflecting on grace. Specifically, what it means to extend grace to myself--when it's okay to fail and how to show myself a little extra compassion when I miss the mark. It's always been much easier for me to empathize and forgive others. This last year has taught me that I need to grant the same grace to myself. This means zooming out and seeing the bigger picture, fully experiencing a moment instead of rushing to record it, not assuming responsibility for things out of my control, not always striving for perfection, and recognizing that lessons live right behind failure. And sometimes, it means knowing when to stop trying so hard. Take these marshmallows, for example. The idea for Nutella marshmallows was swirling through my brain for two weeks. I had everything I needed to make them, but when I grabbed the bottle of Frangelico, I realized quickly that the top wouldn't open to the bottle. I tried and tried and tried to unscrew the cap, but my grip was no match for the sealed-shut top. I'd abandon the project, forgetting about it for a day or so only to have it march back to the forefront of my thoughts waving its arms, demanding my attention. I'd find myself back in the kitchen trying to pry open the bottle with every last bit of upper body strength I could muster. All with no luck. Meanwhile, combine corn syrup, sugar, and remaining 1/2 cup water in a small pan. Heat on medium until mixture reaches soft-ball stage, or 240F. Remove from heat. Turn stand mixer on low, slowly begin drizzling hot syrup into the gelatin in a thin stream. Once combined, turn speed up to medium. Whisk for 5 minutes. While the mixture is whipping, spray an 8x8" square straight-sided pan with non-stick spray. Combine corn starch & confectioner's sugar together and use to dust the pan with. Tap to remove excess. Using a greased off-set spatula (It’s gonna get sticky and messy so if you want to sit and play and be messy, go for it. Otherwise, grease it up!) evenly spread the marshmallow out into the pan. Allow to set for at least 4 hours. Once set, cut into squares or shapes using your favorite cookie cutter dusted with corn starch/confectioner's sugar mixture. These sweet treats are perfect for sharing with your valentine, shipping to friends or for treating yo self! If you're a Valentine's Day hater, let me apologize now. I've got a few more posts headed your way in the next week. They're full of hearts, sprinkles, and sugar, which may or may not warrant a red-and-pink intervention on my part. SORRY NOT SORRY. In my last post, I told you I wanted to share some of the things I loved with you. Today, I'm gonna keep the theme going and share s'more (get it?--I told you there'd be puns! and no, not that kind). With that being said, it may come as no surprise that I love making marshmallows. The first time I made them, I was filled with this awesome sense of wonder that with a few ingredients, a Kitchenaid mixer, a candy thermometer and some patience, I could create the most fluffy mallows I had ever tasted. If you've never tried a homemade marshmallow, get yourself a candy thermometer and get on it! Trust me on this one: you'll never look at the store-bought kind the same way again. These S'mores Hearts would make a great gift for your sweetheart or send some to your friends! I'm a big fan of sending sweets to my single friends on Valentine's Day and these were a huge hit last year. I always say that a marshmallow is like a hug in your mouth--so why not send your pals a hug sandwiched between cookies and topped with chocolate? Isn't that what any true friend would do? These s'mores have three basic components--homemade marshmallows, chocolate and homemade graham crackers. You can really use any recipe you'd like for the graham crackers or the marshmallows. I adapted mine from Smitten Kitchen with a nod to Alton Brown's recipe with the addition of molasses for depth. [I like that Deb from Smitten Kitchen *doesn't* use graham flour, as it can sometimes be tough to find]. I've also listed my recipe for raspberry marshmallows, but if you'd like to use a different recipe, like say, Chocolate Truffle Stout, Cinnamon, or Mint Marshmallows, go right ahead! The basic idea is to spread the mallow mixture in a pan, cut the cooled marshmallows using a heart-shaped cookie cutter, cut the graham cracker dough with the same cutter, bake the grahams, dip them in chocolate and sandwich the heart-shaped mallows in between. Easy peasy, right? Right. These s'mores hearts were part of a Holiday Food Party, thrown by myself and 13 other amazing bloggers. From ice cream to cookies, plus red velvet, tarts, cupcakes & more, we've got plenty of sweets & treats for all your Valentine's needs, so be sure to check them all out! Whether you make one recipe or all 14, I have faith in you, grasshopper. Now go forth and spread heart-shaped cheer! Meanwhile, combine corn syrup, sugar, 1/4 cup water in a small pan. Heat on medium until mixture reaches soft-ball stage, or 240F. Remove from heat. Allow to cool 3 minutes. Once set, cut into hearts with a heart-shaped cookie cutter dusted with corn starch/confectioner's sugar mixture. In a small bowl, combine the wet ingredients--honey, molasses, milk and vanilla. Stir until it's well combined (make sure there's no honey or molasses stuck to the bottom--it's sneaky like that!). Add the wet ingredients to the flour/butter mixture and pulse a few times until the mixture starts to form a dough--it should be a little sticky. Place the dough onto a sheet of plastic wrap, shape into a 1" thick square and wrap with plastic wrap. Refrigerate for 2 hours or until firm. Once the dough has been refrigerated, transfer to a floured surface. Cut the dough in half--keep one half in the fridge until you're ready to roll it out. Roll out the remaining half to a rectangle about 1/8" thick. Cut with heart-shaped cookie cutter and place the heart grahams on a parchment-lined cookie sheet and freeze for 15 minutes in the freezer. Repeat with the remaining half of the dough. Bake 15-20 minutes or until just golden brown and firm to the touch. [Baking time will vary depending on your oven and the size of your cookie cutter--I've made 1" grahams that baked in roughly 12 minutes and larger 2" grahams that took around 18-20 minutes.] Allow to cool. Dip one side of the grahams in chocolate. Sprinkle with sprinkles or non-perils, if desired. Place dipped cookies on a parchment lined cookie sheet and refrigerate 10 minutes to set the chocolate. Remove cookies from the refrigerator, place two graham chocolate side down and add a thin layer of chocolate to the graham side of each cookie. Place a marshmallow heart on top of one of the graham cracker hearts and top the marshmallow with the other graham cracker heart, forming a sandwich. Allow the s'mores to set for 20 minutes in the refrigerator. Fall in love with all our #HolidayParty Recipes! Check them out below! **This post contains affiliate links, meaning if you click on an Amazon affiliate link and buy something from Amazon, I get a teensy percentage of the sale, which I put towards things like buying sugar and webhosting (cuz that ain't cheap!). 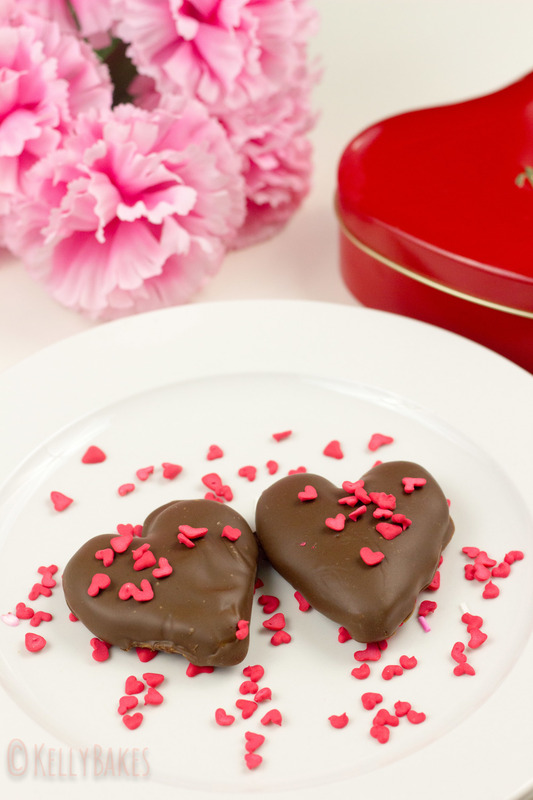 A gluten-free, homemade version of peanut butter hearts--perfect for Valentine's Day! It's the time of the season when love runs high. As such, I thought I'd share a few things I love with you. For starters, I love geeky things--logic problems, crossword puzzles, data analysis, dorky guys in square glasses, grammar (I took a course in it 'for fun' in college). Though I unabashedly still geek out today, the crowning moment of my dorkdom was probably being elected my high school's Latin Club President two years in a row. Maybe it's because my birthday is the Ides of March that I had a natural proclivity toward Latin, or maybe I just love me some epic, twisted tales of the Roman empire on 8 VHS tapes (WARNING: slightly NSFW!). Whatever the case, I took five years of the language and every year, it was my favorite class. At some point, we translated Catullus, whose poem Carmen 85, gave me one of my favorite and most-loved phrases in Latin, "odi et amo," or, "I hate and I love." Line a cookie sheet with parchment or wax paper. Remove from microwave. Stir in peanuts, if using. Working in 2 batches, stir in half the confectioners sugar, until well combined. Repeat with the other half of the sugar. You should have a thick dough. Roll a walnut-sized ball of peanut butter dough into a ball or scoop using a small ice cream scoop (or a medium one. #treatyoself. We don't judge here at kellybakes.com). Place each ball onto the parchment-lined cookie sheet. Shape each ball into a heart shape. Once all hearts have been formed, place the cookie sheet into the freezer for 1/2 hour. When the chocolate is melted, give it a final stir, making sure that no hunks of chocolate remain. Remove the peanut butter hearts from the freezer. Dip each heart into the chocolate. Flip over with a fork or a miniature off-set spatula to coat completely with chocolate. Allow any excess chocolate to drip off each heart. Place each heart back onto the parchment lined sheet until the chocolate sets up (approximately 30 minutes). My name is Kelly and I am a peanut butter cup addict. It may have started when in 7th grade when I had to come up with a math lesson for class and taught my peers how to triple a batch of peanut butter squares with algebra and actual baked goods... but only half of them made it to class [whoopsie]. Really, though, I should have seen the signs earlier, like when, at age 8 I asked my dad to buy me an entire box of Reese's cups from BJ's or, at 6 when I shamelessly pilfered Reese's peanut butter eggs from my sister's Easter basket when she wasn't looking. I had have a problem.